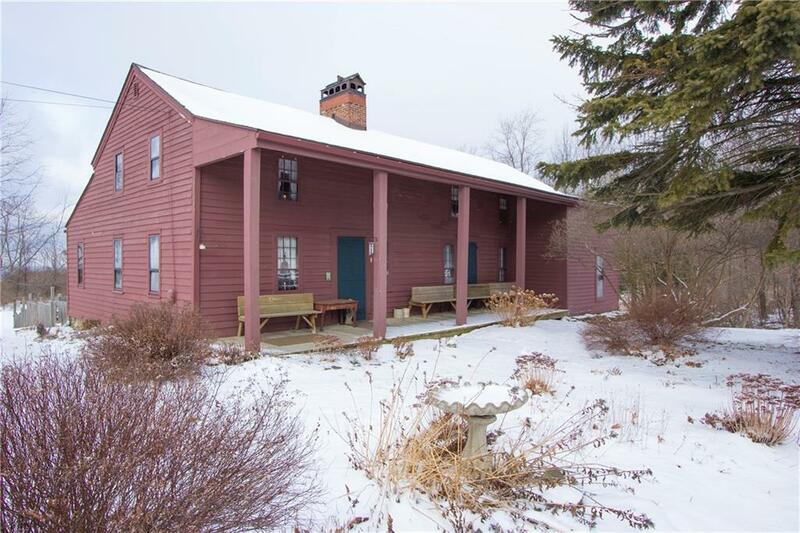 1795 former Stagecoach Inn & Tavern loaded w/historic charm! 2/5 fireplaces have wood stoves & original pot arms. 2 front entrances allow for poss. home office/business/B&B. Walk-in pantry w/2 cabinets & French door stainless fridge, glass top stove, over range microwave & dishwasher give the kitchen modern conveniences. 1st flr has full bath & laundry, bdrm w/.5 bath, bdrm w/sitting rm, formal din rm, liv rm, fam rm & 3rd bdrm. 2nd flr has potential owner/teen suite w/family rm flanked by 2 bdrms. 1 bdrm has full bath & bonus rm. Basement has the remnants of a beehive oven used for baking at the Inn & walk-out door to creek & waterfall. Newer roof, mechanicals & whole house generator. Enormous attached workshop, separate wood shed, carriage house, pond, stone wall, amazing view!